Jon is missing and so is Hunter, Clark asks Lois if she has seen them when Clark doubles over and says, "Kryptonite". 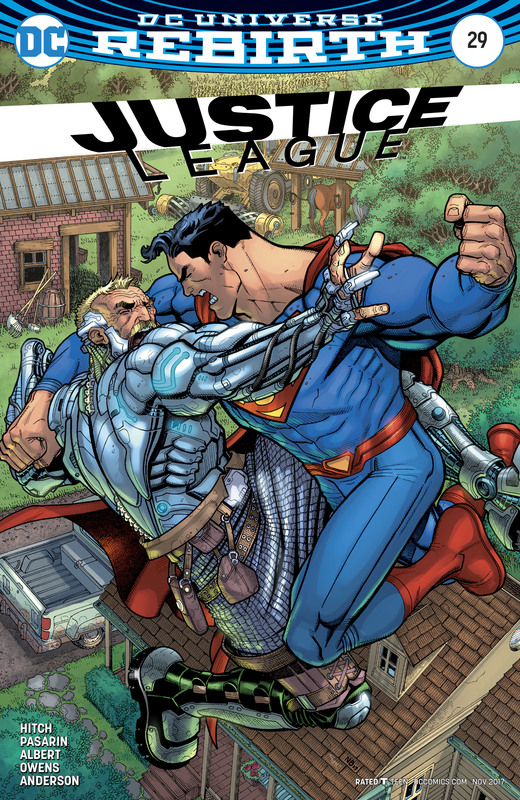 Arthur Curry appears out of nowhere with Kryptonite he stole from the Batcave (see issue #27) and proceeds to beat Clark mercilessly before throwing him over his shoulder and leaving just as quick as he came. Wonder Woman is still remembering her battle against the Kindred while the majority of the children from the future await to attack her saying, "Wonder Woman dies, our future lives". When they attack Wonder Woman is ready and easily defends herself from the first wave until Hunter joins the fight. Batman leans over Lois who is starting to wake up from her confrontation with Arthur. She tells Batman he took him and he needs to assemble the League to help him. Aquaman proceeds to take out Flash, Jessica Cruz and Cyborg. He takes Cyborg the same way he took Clark. Lois is filling Batman in on the kids from the future before ranting on the fact that Batman had instruments at his disposal that could hurt, even kill Clark and Jon and says, "Whenever this is over, you and I are going to have a conversation, but right now find my husband." Wonder Woman appears to have the upper hand on Hunter when he calls for Cube to open a portal. However instead of where it was supposed to go, it teleports the children and Wonder Woman to Midway City, the place Baz has been helping keep quarantined from whatever parasite is there. Hungry. Open. Feed. Grow. Baz keeps hearing these words. As soon as the children land Baz succumbs to the voices, lowers his shield and releases the darkness that devours Wonder Woman. Back at Amnesty Bay Serenity, the one child who did not join the others, and Mera are still "reconnecting". Mera asks her daughter what happens to her and Arthur in the future. She explains to her that she died fighting until the end, but Arthur he... appears in front of them. Serenity immediately goes into attack mode. Mera asks if he is there to kill them and he respond "Never you". He then says he is sorry and proclaims that Sovereign Queen of the world has come to reclaim everything she has lost, and she will burn the world to find it. Story - 5: While the last issue was short on action, this issue was all action. 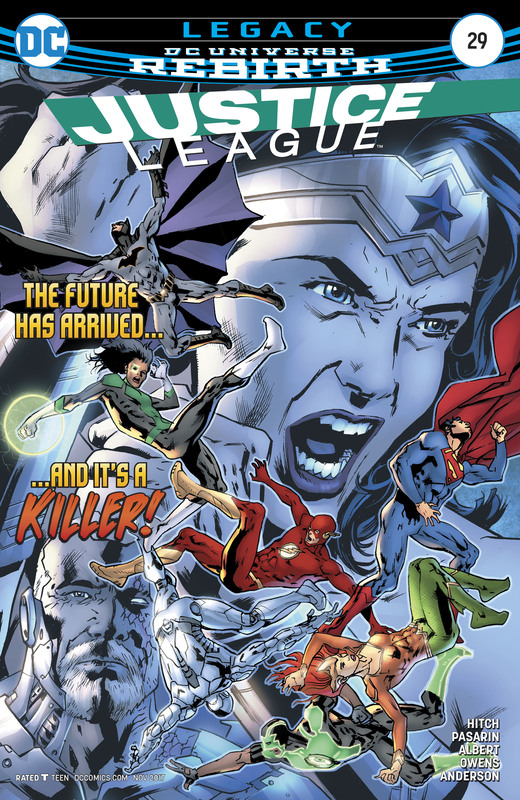 I really feel that this is Bryan Hitch's best work on this title from the beginning. I also feel that this entire run has been one giant story arc. I may just reread this entire run once he finishes up his run on the title. A few questions emerge out of this issue; Do we really need to rehash the "Tower of Babel" story arc as Lois seemed none too pleased about Batman's contingency plan? What did Arthur do with our four heroes he took with him after defeating them? And are my suspicions correct that Diana is indeed Sovereign? If you gave up on this series go back and pick up this story arc, I think you will enjoy it. Art - 4: While the art team has not changed, I personally feel this is a small step back from the previous issues. Still solid work however and very easy on the eyes to look at. Cover Art - 3: As a whole this is not a bad cover, but if you look closer there is no definition on the faces of our heroes and that, as I have stated before, is a turnoff for me. Not a bad cover and a little extra work on the details would have elevated this cover up to a possible 5. Variant Cover Art - 4: This is the cover I chose for my collection, mainly because it featured Superman in battle front and center, and I am after all a Superman fan. Drawn by Nick Bradshaw, it reminded me a lot of Jon Bogdanove's Superman when he worked on the title, and that's a good thing. If you see this cover give it a look.